Outlines are black curves that highlight edges between colored areas. They can be turned off in Step 1 by moving the slider all the way to the left or in Step 4 by selecting the No Outlines style. To edit outlines one by one (as opposed to changing the overall density of outlines in Step 1), click on Edit Outlines in the Step 3 toolbar. There are two modes for manual outline edits, Draw and Erase. 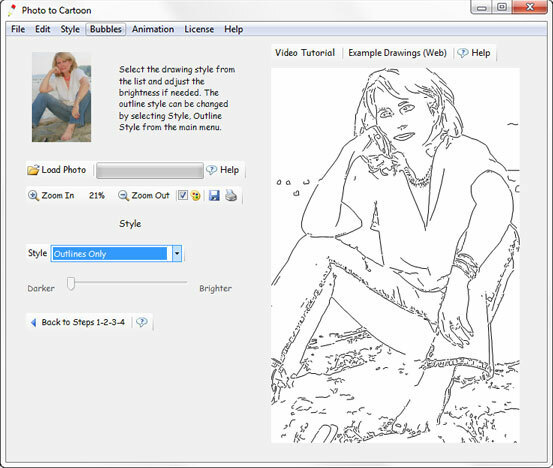 The Drawing mode is for adding new lines, whilst Erase is for erasing existing lines. Usually, it is a good idea to zoom in into the image when using these tools as it increases the drawing precision. The parts of outlines (including user added lines) that intersect or get close to other outlines are omitted. This behavior can be changed by selecting Style, Outline Style from the menu and setting Line Spacing to zero. The line width can be changed at any time by selecting Style, Outline Style from the menu and it affects all the outlines, so that all the lines, new and preexisting, always have the same width. Increasing the value of Min Line Length eliminates short outlines.